Step 1. Bake and ice your white birthday cake and place it on a nice pedestal cake plate. Step 2.åÊTie the string onto the blunt ends of the skewers about 2cm from the top, using a slip knot. Cut the letters out from the bunting template and use the pinking shears to cut along the bottom. Fold the top third of each letter over so you can hang them on the string. Step 3.åÊSort your favourite coloured Smarties. Push them into the cake icing in a pretty pattern. Step 4. 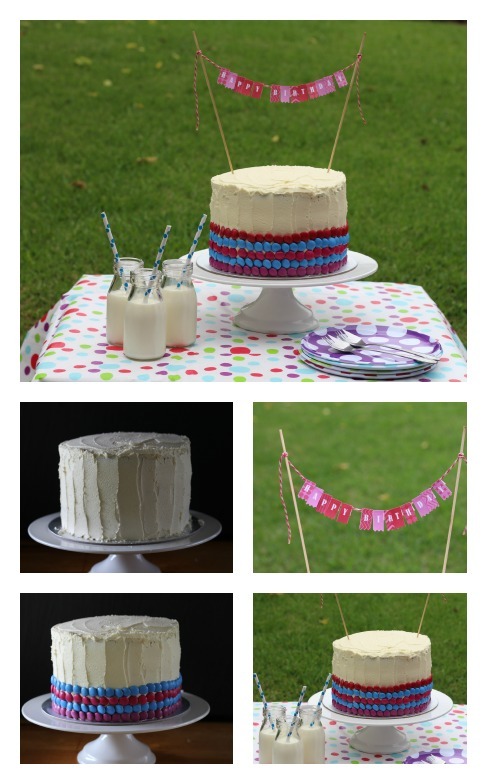 Push the skewers into the cake and hang the bunting letters over the string. What can you do if you don’t have time to bake a triple layer white cake? Well you can sneak into the supermarket or bakery and grab three ready-made cakes or sponges and ice them. Voila! If you don’t think you will have time to make this cake then you can bake the cake and freeze the layers wrapped in cling film for up to two weeks before you require them. This recipe was created by Jennifer Cheung for Kidspot, New Zealand’s beståÊrecipe finder.